Born Pessa Lewi, the youngest child of of Benjamin and Faiga Lewi. 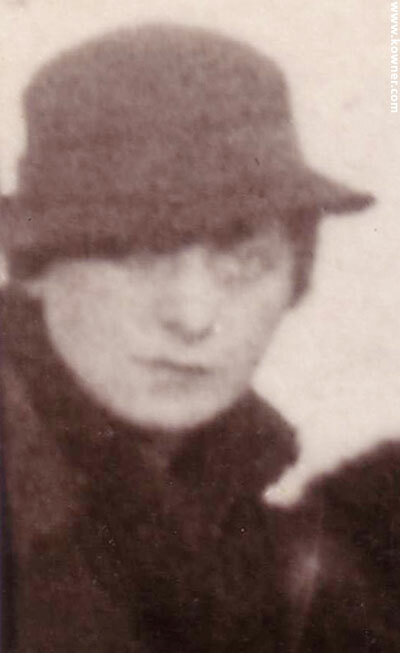 The youngest sister of Maita (Lewi) Hochenberg, Wowo Lewi, Lola (Lewi) Adler, Mendel Lewi, Dawid Lewi, Rachel (Lewi) Adler, Regina (Lewi) Rubinek. Wife of Ilia Kowner and mother to Leon and Nina Kowner. She grew up in Lodz and studied in Krakow. Pessa Kowner was exterminated by the Nazis in August 1944. She was forty two years old. "My Mother, Pessa (Pola), played the piano and spoke several languages such as Polish, German, French, Russian and Yiddish. Highly elegant in her style as she would sometimes wear a vail and used Chanel 5 perfume. My mother and my father used to go biking in their vacations across Poland. "Unlike her other siblings she went to a secular education. She graduated the doctorate program in humanities in the Jagiellonian university, Krakow. She studied there together with Zina Kowner, who introduced her to her brother, Ilya Kowner. They married on 12.5.1926 in Lodz. "In 1927 I was born, and eight years later, in 1935, my younger sister Nina was born.
" I remeber mother being very active and a fighter in the good sense. "During the ghetto's first two years my mother opened a laundry in our small apartment. I helped her a lot and would carry the laundry to distant places in the ghetto where we would heat up the vat and then I would carry it back. Later on, due to the high inflation it didn't make sense to go on working the laundry. Later on, she found the almost impossible job in a factory kitchen and would give her personal ration for the sake of us, her children." "A year later I met a friend who survived the war and she told me that the S.S. doctor took out her mother and Nina and ordered them to the death side and herself and my mother to the living side. Nina yelled and our mother, Pola, jumped to the death side. That was the last day in the life of my sister Nina and my mother Pessa Kowner."